Made with oatmeal  great for the skin  and Peppermint essential oil to tingle the senses, this is an invigorating wake up call in the morning or a revitalizing scrub anytime of day. 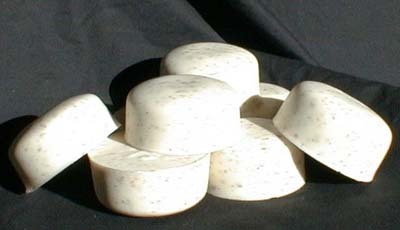 NOTE: this soap comes in rectangular chunks, not round as pictured. 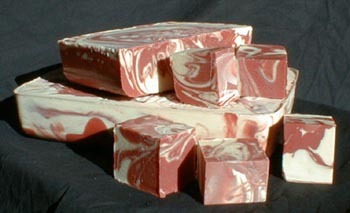 Fire meets water in this spicy cinnamon-swirl soap made with essential oil of Cassia. 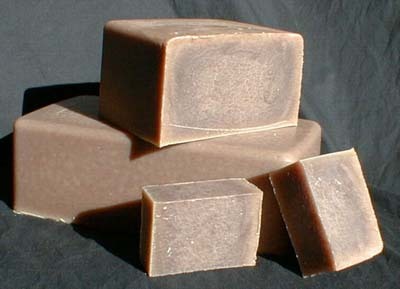 If you love cinnamon, this is the soap for you! Youll want to wash again and again after being captured by the rich character of this soap. This creamy golden creation is a blend of essential oils of Lemongrass, Rosemary, and Cinnamon, topped with a luscious layer of Chamomile flowers. If the Conquistadors ever did find the city of gold, were sure the inhabitants were washing with this soap. Fresh as an ocean breeze. 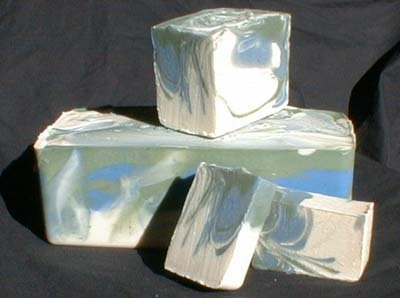 Frothy blue-green waves wash over your skin to cleanse and freshen with exotic essential oils of Ylang Ylang, Lavender, Sandalwood & Patchouli. Peace, Love and... SOAP? This "Summer Of Love" masterpiece combines the old friends Lavender & Patchouli and is complemented by the addition of the herb Comfrey to tend to your skin while the oils nurture your soul! Get out your Tie-Dyed T-shirt, dust off your guitar and remember Flower Power~! ...and then - you can wake up from that dream and shower with this soap! This soap is an adventure! The natural earthy essential oils of Cedarwood, Sandalwood, Tea Tree, Clove and Pine combine in a raw excursion through the wilderness... in the comfort of your own bathroom. 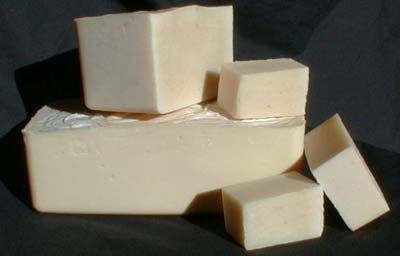 Based on the traditional Spanish Castille, this soap is still primarily Olive Oil  but with the additional blending of Avocado, Palm, and Coconut Oils, and a light Citrus essential oil essence to give it a distinct west coast flair. This is truly a laid back (mild) soap. We must admit, more than one person has taken a bite out of this soap. It looks like a frothy cup of cappuccino, and smells quite delectable. 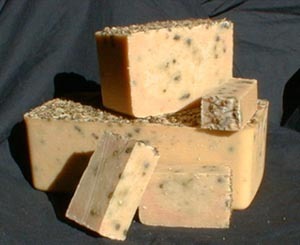 Combining Vanilla, Almond, Nutmeg and real Coffee, this soap is meant for your skin, not your tastebuds! 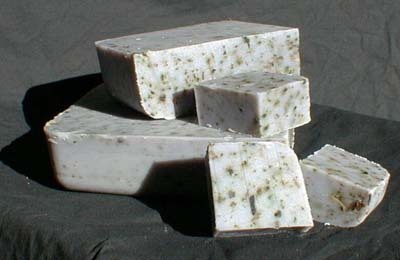 This is a variety-pak of our soaps - four 1 oz. 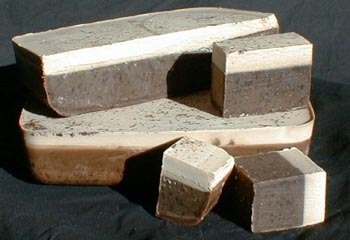 chunks of our Premium Soap for $5.00 - - Here, you see a SoapBox with Sampler Paks crawling on it - YIKES!... I know you'll find it hard to believe that soap talks, but we make'em special and these Soaps are calling your name!